Samsung has always been one of the best producers of the Android smartphones, and the next official phone for Google is again from Samsung, and it is going to be the Samsung Nexus Prime. This could be one of the most advanced smartphones of the recent types, and would be surely competing the iPhone 4S pretty well with the specifications it has got. Samsung being a company that produces the internal chipsets too, is going to provide the chipset for the 1.5GHz processor and it is going to be the PowerVR SGX543MP2 which is seen in the iPad 2, so one can expect the speed of the phone to be lightning fast. On the rear side, there is an 8-Megapixel camera with a capability to record the Full-HD 1080p quality videos. 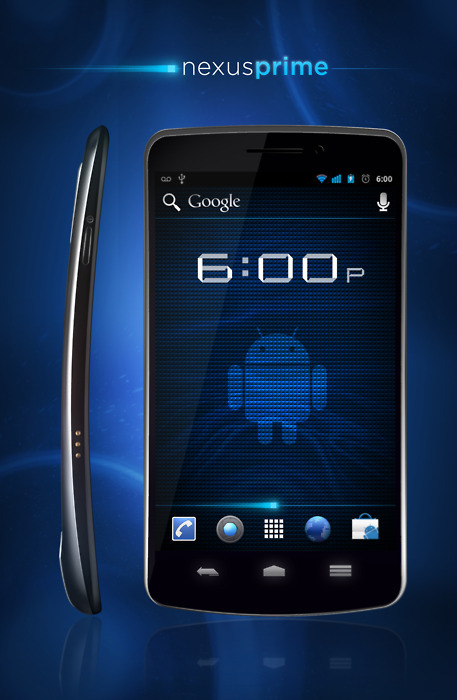 The Nexus Prime would be having a 4.65-inch capacitive touchscreen display with 1280×720 pixels resolution. The design of the phone is another classic feature of the Nexus Prime, which is a bit similar to the Sony Ericsson Xperia Arc which has a curvy body that bends inwards to the screen side, and as the leaked pictures and specifications show, it has no physical keys on the front side, and the navigation, home, back keys are all touch sensitive keys. The 2050mAh Battery is surely one of the best things to be seen, which would increase the battery life of the Nexus Prime to a lot higher and better comparable to the other smartphones. This would give the phone at least a day of full usage battery life. The official launch of the phone was expected to be on October 11th, but that is postponed as Google says the reason behind being the death of Steve Jobs due to the Pancreatic Cancer. You have a very nice blog. I love to read posts from you.